An artificial Christmas tree that didn’t look ‘real’ at the base was Ryan Kenny’s inspiration for one of the most ingenious holiday ideas we’ve ever seen. Kenny is the inventor of the Christmas Tree Hugger, which wraps around the bottom of artificial Christmas trees to give them a thicker trunk that looks like real tree bark. 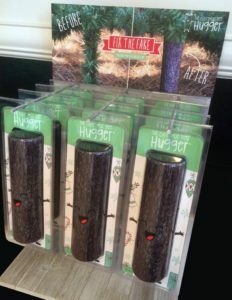 He crowdsourced funding for his original prototype through Indiegogo, and is in full production for 2016 sales of the Christmas Tree Hugger on his website and at select retail outlets. Ryan’s passion for Christmas extends to giving back to others, so he is donating a portion of the proceeds from each sale to the Christmas Tree Santas! He took a few moments recently to tell us more about his product. Santas: Hi Ryan. So what exactly is a Christmas Tree Hugger? Ryan: The Christmas Tree Hugger is a brand new product that literally makes fake Christmas trees look like real trees. In just a few seconds, it transforms the fake looking fuzzy green pole at the base of artificial Christmas trees to look just like real tree bark. It really puts a nice finishing touch on artificial Christmas trees. Once you see the difference it’s hard to go back. Santas: It’s a great idea. What was your inspiration? Ryan: My wife got sick of me complaining about how goofy the fuzzy green pole at the bottom of our tree looked. She said I should just fix it. Assuming there must be something available to fix the fake factor, I hit the Internet and came up empty handed. The next day I decided to create a way to give the bottom area a face lift. Glad I went to art school. Santas: What happened next? How did you take your idea and turn it into a real product? Ryan: I soon found myself measuring hundreds of Christmas trees on display in stores, making sketches and creating hand made prototypes with all sorts of materials from home improvement stores. After plenty of experimenting, I started the patenting process and began to source manufacturers to help me fine tune what I started. Santas: What kind of feedback have you gotten from family and friends? Ryan: Friends and family all love the idea and were extremely helpful and supportive when I put together a crowdfunding campaign on Indiegogo to help raise funds to assist in making this passion product a mass produced reality. Santas: Tell us about your own Christmases. Any favorite memories or traditions? Ryan: Actually, as a child I took our family Christmas tree very seriously. I wanted it to look perfect each year so that Santa would be impressed. I don’t know how many kids do this, but I would actually sneak downstairs and sleep under the tree the first few nights. I was always so proud of it. Santas: What is it about the Christmas Tree Santas that inspired you to donate some of your proceeds to our organization? Ryan: I was always ecstatic to decorate the Christmas tree each year growing up, and there is definitely some serious holiday magic in the air after that tree goes up. Now that I have my own kids, I see that same magic in their eyes each year. I can’t imagine them missing out on that, and love how your charity brings that magic into homes that need it. Santas: Thanks! We’re grateful to work with you. 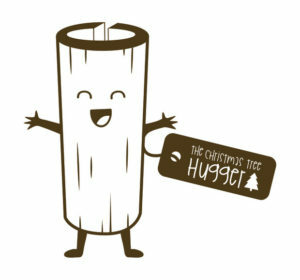 Tell us where can people buy a Christmas Tree Hugger. Ryan: Our website has all the details about the Huggers and links out to our Etsy shop.